This page displays ALL of the strips of Starhawk which appeared in Spike Issue 1 from January 1983 until the strip ended in Issue 67 in late April 1984 when Spike was amalgamated with Champ.This was the last time Starhawk would appear in a weekly comic as a regular series! 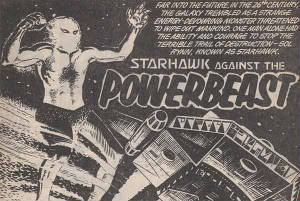 Thanks to Rod from the Crunch sub-forum at ComicsUK for this information pertaining to Starhawks reappearance in Spike of early 1983(also for the cover issue scan of Spike in the Covers page).Rod has very kindly supplied the entire run of strips from Spike. Spike ran to 67 issues and then merged into Champ. 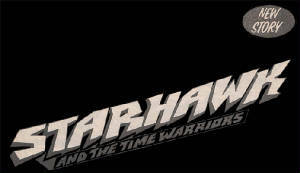 Issues 1 -15 "Starhawk against the Power Beast"
Issues 16-29 "Starhawk and the Time Warriors"
Starhawk has to battle a Creature that cannot be destroyed! And if the Krell are to survive,they must help him!Click on the picture to begin reading this 15 part series now! The Krell travel back in time to destroy Mankind before he reaches the Stars! Can Starhawk stop them in..Time?Click on the picture to begin reading this 14 part series now...before it's too late!